Pet Buddy pet vac will eliminate all of your pet hair problems and make grooming fun! If you are tired of all the different grooming brushes and time spent brushing your pets, only to find they are still leaving hair behind everywhere they go, then you need the PetBuddy pet vacuum attachment! This innovative wet / dry pet care system grooms all pets safely, gently, and effectively! Pet-Buddy is a pet vacuum attachment that attaches to your existing vacuum. It comes with an extra long hose so you can leave your noisy vacuum cleaner in the other room and your pet won’t be afraid. It is so easy to use, grooming and removing pet hair is a snap! Simply attach it to the vacuum, turn the vacuum cleaner on, and gently brush your pets fur with the included grooming tool. Now the hair that your pet would normally leave all over your home is neatly trapped inside the pet buddies hair vacuum! The hair empties easily into a garbage can or bag! 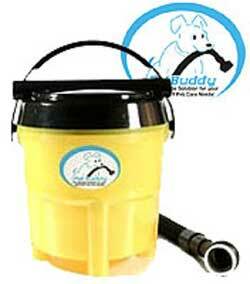 Pet Buddy petvac also works great after bathtime for drying your pet and removing loose hair! Use the amazing pet vacuum attachments to vacuum pet hair from furniture and clothing effortlessly! You can also use this As Seen On TV pet vacuum system when house training pets to clean up messes made on the carpet! 1) Attach the PetVac to your Vacuum using the included adaptor and start your vacuum. 2) Use the included Grooming Tool to gently brush your pet’s fur. 3) The hair that would normally shed all over your home is gently removed from your pet and is deposited in the PetVac. 4) PetVac easily empties into the garbage, and all the mess of animal fur is easily captured.